One thing that was always great with Linux desktop X11 (and continued with Ubuntu 12.10) was copying text with a mouse selection and just pasting it with the middle button. That’s why I became horrified when it started to not work with Vim! It has to be a way to have a clean copy/paste again! and now just paste the text the way it was supposed. Hurray! Now press Esc and get back to our helpful indentations with :set nopaste. Less typing, may I ? Of course there’s a pragmatic way of doing all these. We can define a keyboard key to just make the copy/paste a safe operation. I’m using key F12. Another way it’s to just paste what you want into the line you are at in visual mode. xsel is a command line X11 tool to manipulate its “clipboard”. This mapping reads into Vim the output of xsel which is the clipboard copy buffer. I’m using this one. 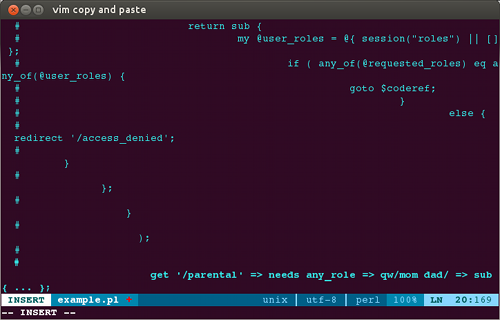 Vim customization and plugins broke a plain simple copy/paste. However we got a no brain and fast solution with our F12 key. btw, love your statusline, would you mind to share?